Oman is an Arab country on the southeastern coast of the Arabian Peninsula in Western Asia. A significant portion of its economy involves tourism and trade of fish, dates and certain agricultural produce. Dates have been a staple food of the Middle East and the Indus Valley for thousands of years. Date fruits are oval-cylindrical and when ripe range from bright red to bright yellow in colour, depending on variety. Dates contain a single stone. Three main cultivator groups of date exist, soft, semi-dry and dry . The type of fruit depends on the glucose, fructose and sucrose content. Dry or soft dates can be eaten as is or are stuffed with fillings of nuts, candied fruits or even cheese. Dates can be chopped and used in a range of sweet and savoury dishes. The sugar content of ripe dates is about 80% the remainder consists of protein, fiber and trace elements. (Source Wikipedia). Dates act as a natural sweetener and is a good replacement in many of the recipes that uses white sugar. It is also very good for your bone health and has numerous benefits to it, i.e. high in several nutrients, fiber and antioxidants. Some of the dates recipes on my blog. While I was searching for O, I hopped on to this Omani Maldouf recipe with Dates. 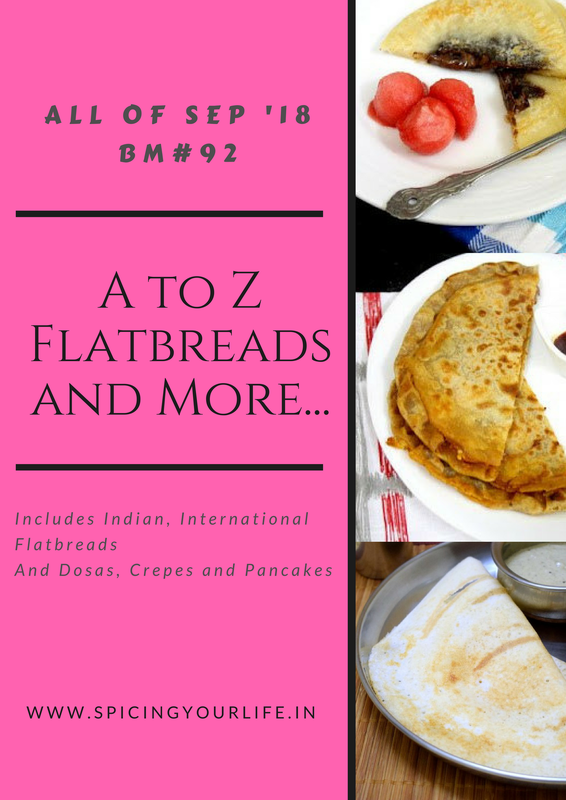 A FlatBread or a paratha with Dates. I immediately shortlisted it as it is a healthy dose for everyone. I paired it with a spicy gravy and kid’s just enjoyed it as is. The bread/paratha/thepla is very mildly sweet but is a good way to serve dates to those fussy eaters. Traditionally the bread is made with All purpose flour but I made it with whole wheat flour. Do give this recipe a try and let me know how it turned. This Omani flatbread is a deep flavourful, flaky bread with a mild sweetness that compliments spicier dishes/curries or can be eaten as is. Soak the pitted Dates in 1 cup of boiling water for 2-3 hours or until softened. Puree the softened dates using a strainer or a fine mesh. You may require a blender to blend, if it is not very soft for you. Mix the pureed dough along with salt, 1 tbsp ghee, and flour and make a soft dough. Let the dough rest for minimum 20 minutes. Divide the dough into equal or lemon size balls. Shallow fry each using ghee until cooked from both the sides. Since the dough have dates in them, it will be cooked very fast. Quite an interesting flatbread and thats a lovely find Renu. Wow, this dates paratha will definitely one of the best way to sneak dates in our diet na. Looks fabulous. Amazing paratha :)) well it’s a date Paratha right ? Just with a fancy name , but what a lovely one . So healthy and nutritious . I must try this bread , it surely looks and sounds fantastic . That is a brilliant idea to mix dates puree into the dough. Awesome find for the letter O. I shall make this for my little one. Wow a paratha stuffed with dates.. awesome. A n ideal way to enjoy sweet flatbread as dates are good for health. Quite an interesting flatbread. Yes I haven’t read about this before and sounds like a great way to use dates. It’s good that kids liked it as such! This is such a unique recipe! The date stuffed bread will surely be a hot with the kids !! Mildly sweet and savory this dates flatbread must have tasted wonderful with a spicy gravy. I would love to have it with a pickle as a side. This is a great dates recipe. Lovely way to incorporate dates in our diet. I just happened to go to a Middle Eastern store and bought a pack of dates paste. That paste will work so well for the recipe. fabulous idea of making dates flatbread. really with natural sweetener this flatbread is nutritious and healthy. Also I found another way of eating dates.